I'm a little shocked that the Product Managers at Blackboard let a release go out where linking to internal content wasn't built-in. Learning to use Blackboard for setting up an online course is a certainly a recipe in frustration. Even more so, if you are inheriting a course shell that has had too many hands in it over the last 8-years! To me is seems that Blackboard is too technical for non-technical people and too restrictive for technical people. It seems to serve neither audience well. After much searching, and consulting with coworkers, I have finally figured out a convoluted, yet effective, method for determining a URL to content that was generated using Blackboard – content such as Quizes. For content written in HTML and uploaded as files, you can use relative linking – so no special process necessary, just make sure you aren't using the full filepath. Using a Firefox browser (works on Mac and PC – don't know the process for other browsers). Ensure you are in Student View, by clicking the Student view tab. Navigate to your content. Ensure your content – exactly where you want the link – is showing in the main panel. Place your mouse pointer anywhere within the frame and right-click. Select This Frame > Open in New Window. Navigate to the new window and copy the URL. This is the URL you can use in your content. Funny, now that I write it, it doesn't seem so complicated. 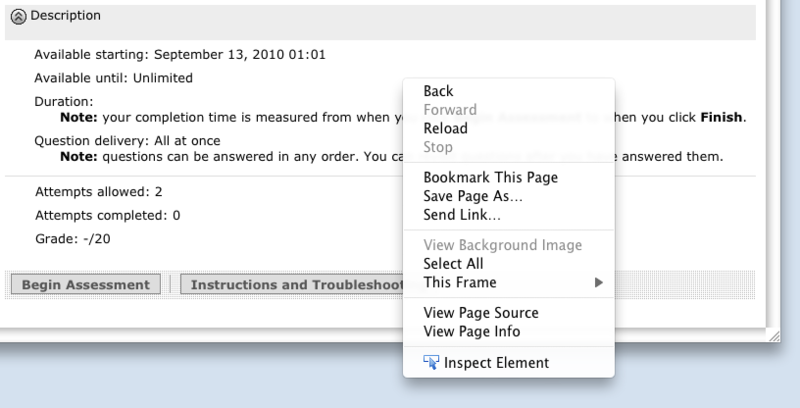 But really, how difficult would it have been for Blackboard to create a "get URL" link in the Build view? I don't really like Blackboard Vista (formerly WebCT), there are better products out there, but inertia is hard to fight.